Any number of factors go into why people decide to move from one state to another. Maybe it's to take a better job, or to be closer to family, or simply ditch the long slog of winter for somewhere you can hit the beach year-round (yes, please). Though, as demographics shift, old-school industries stumble, and the population ages, some unexpected locales are proving more popular than ever, at least according to the latest intel on the fastest-growing states in the country. In a fresh batch of data collected by the US Census Bureau between July 1, 2017 and July 1, 2018, the fastest-growing states in the country in terms of population last year were Nevada and Idaho, which saw an increase in people by roughly 2.1% apiece (both states were at the top of the list last year, too). Utah, Arizona, and Florida followed closely behind, rounding out the top five states where population grew the most during the past year. These are the top 10 states that saw the biggest boom in population during the aforementioned 12 months, ranked from slowest to highest percentage growth. So, what explains the big increases in these somewhat unexpected places? Well, essentially, it's because there have been more deaths and fewer births elsewhere. In fact, nine states actually saw a decline in population over the last year, including New York, Illinois, West Virginia, Louisiana, Hawaii, Mississippi, Alaska, Connecticut, and Wyoming. Overall, the US population grew by 0.6% over the last year, per the Census stats, thanks to both "natural increase" (births) and international migration. Also, while both Texas and Florida made the top 10 in terms of percentage increases in population, they took the number one spot in two other metrics. Texas had the biggest growth in terms of actual people living there (379,128) and Florida saw the biggest influx of domestic migrators (132,602). 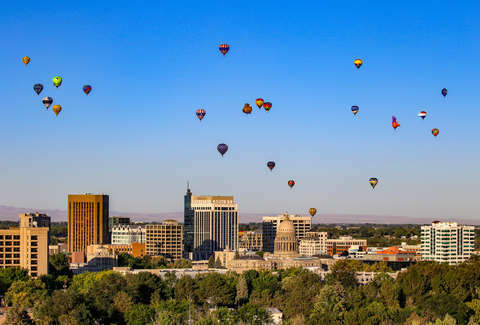 And sure, there are lots of reasons certain states are growing fast, but hey, maybe Boise and Reno really are underrated after all.